Table of Contents Next: Giffard, George J.
Robert Ghormley was born in Oregon, the oldest of six children of a Presbyterian missionary, and took a bachelor’s degree from the University of Idaho (1902) before attending the U.S. Naval Academy, from which he graduated in 1906. (At the time, the Naval Academy did not grant bachelor’s degrees.) He served in Nicaragua and with the battleship force of the Atlantic Fleet in World War I, as captain of Nevada, and in several staff positions between the war. 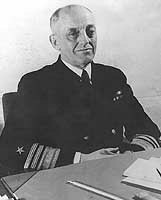 He graduated from the Naval War College in 1938 and was promoted to rear admiral shortly thereafter, serving as chief of the War Plans Division. Every day I was in London I felt more and more that England and, in fact, civilization was in great danger, and that the United States was the only country which could turn the tide. He was used by Roosevelt to bypass the Ambassador, Joseph Kennedy, and the State Department and negotiate the secret ABC-1 agreement for worldwide strategy against the Axis, at a time when the United States was still formally neutral. He was briefly commander of U.S. naval forces in European waters before being given command of the South Pacific theater in April of 1942. Relieved in October of that year by Bill Halsey, he held administrative posts for the remainder of the war, including command of 14 Naval District in Hawaii. He directed the demobilization of the German navy following victory in Europe and retired in 1946. The appointment of Ghormley to command the South Pacific Area was unfortunate. Though he had been a flag officer for four years, his posting as Commander, Naval Forces, Europe was his first operational command and he was in his element working with the British. However, Roosevelt utterly refused to give the South Pacific command to the other officer recommended by Nimitz, William Pye, whom Roosevelt never forgave for calling off the Wake relief expedition. Ghormley’s leadership in the South Pacific was uninspiring. He never really believed in the Guadalcanal operation and recommended its postponement. Though both Nimitz and King both expected him to direct the operation personally, he chose to exercise general command from his headquarters at Noumea. Although Nimitz personally visited Guadalcanal in late September 1942, Ghormley never set foot on the island. Part of the problem may have been that Ghormley was suffering from serious dental problems that could not be adequately treated on his flagship. Nimitz was reluctant to relieve his old friend, but concluded on 15 October 1942 that Ghormley was "too immersed in detail and not sufficiently bold and aggressive at the right time" (Lundstrom 2006). Only very recently has Hornfischer (2011) uncovered evidence that Nimitz relieved Ghormley because he believed his old friend was on the verge of a nervous breakdown. Halsey was on his way to the South Pacific to take over the carrier forces there, and Nimitz obtained permission from King to order Halsey to relieve Ghormley instead. Ghormley may have been overly deferential to French sensibilities. The French in New Caledonia were divided in sentiment between Vichy and the Free French, which seemed to require a diplomatic touch. When the colonial governor refused to give Ghormley office space ashore, Ghormley meekly accepted the situation and remained on his flagship, the Argonne ("Agony Maru"), for weeks at a time as it sat at anchor. When Halsey took command, he characteristically told the French that they would give his staff acceptable billeting ashore. And they did. After the war, 1 Marine Division assistant operations officer, Merrill Twining, claimed that Ghormley had sent a pair of messages to Vandegrift on 11 September 1942. The first message, which was mentioned in a number of other postwar accounts, was a very pessimistic assessment of the situation, in which Ghormley all but abdicated responsibility for the fate of the Marines on Guadalcanal. The second, which was mentioned only in Twining's account, was a handwritten note authorizing Vandegrift to surrender if he felt it necessary. Frank (1990) could find no independent corroboration of Twining's account, but judged it plausible. Ghormley was a large man known for his intelligence. Though not possessed of a cold personality, and well-liked and respected, he was somewhat colorless and reserved.